As a consumer, do you always buy the cheapest product or service you can find? If you are like most people, probably not. Do you gravitate towards the most expensive item you can find? Unless you have money to burn, find a once in a lifetime deal, or it’s on your bucket list, again, probably not. The fact is, the great majority of us try to find the best quality products and services for the best price, and are what I call value buyers. Your insurance buyers are exactly the same. We all want good quality insurance products and services for a good price. Knowing this, why do we, as Agents, consistently lead with price? Why do we play the price game, and play by rules established by our prospects? I believe there are 3 main reasons that answer these two questions. The first is psychological, the second is perceptual, and the last is process related. I can’t take out your mind trash for you, but I can give you some advice that might help you take it to the curb by yourself. 1. Don’t you invest one minute of time with price only buyers, walk away and avoid them like they are the plague, because they are. 3. Visit with your best clients and have them tell you why it is they do business with you. 4. Take a look back at all of the services you have provided for your clients. Take a look at the claims that were paid that saved businesses and families from ruin. 5. Look yourself in the mirror and say “I don’t bring much value to the table” and see if you still believe yourself. Less than 10% of the agents I meet say that their primary purpose is to uncover problems, find and provide solutions to help their clients run their businesses more efficiently and profitably. Most believe their responsibility revolves around the insurance policy, and their activity reflects this. Most agents spend the great majority their time reviewing policies, finding gaps, filling gaps, filling out applications, marketing new and renewal business and their CSRs take care of certificates, endorsements and bonds. All of these services, other than the bonding, service the policy not the client. Very few agents and agencies I meet say they have pro-active service platforms, use service schedules or provide value added service like claims, loss control, risk management stewardship etc. The great majority of Agents and agencies are all the same, and can’t claim they make a true difference in their clients business, until a claim is paid. Most are reactive, most service the insurance products they sell, most are not consultants, and cannot claim they provide any significant value to their clients other than saving them money. When agencies and agents move from re-active to pro- active, and from insurance agent to consultant, they can easily sell the value they bring at a higher price. The conversation becomes a very different conversation, and both your value and the level of respect you receive grows. Even after agencies develop significant value added service platforms, they still have a difficult time effectively articulating the value these services and their expertise represents to the prospect or client. They are challenged when it comes to communicating how they can positively impact their clients business. I spend a great deal of time helping clients develop service platforms and coaching their staff how to articulate their advantages. It takes time, effort and a desire to become excellent at your job. 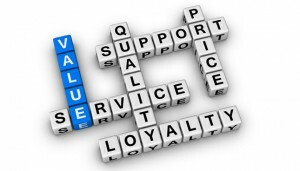 Value propositions are one of the most powerful form of communicating true differentiation, because they clearly articulate the service, the process, the value and the end result to prospects and clients in language they understand. Constructing value propositions is a 4 step process that begins by creating a clear and understandable name for each service you offer like “Claims review” or “Market analysis” Step 2 involves learning to effectively and efficiently describe the process involved during service delivery, the 3rd piece is being able to quantify and qualify the potential benefits directly related to the service and last being able to describe the end result following successful conclusion of the service. Selling value instead of price requires that we get rid of our mind trash, grow from Agents into Consultants, service the client not the policy, and learn to effectively articulate our value. Join me on November 18th for book optimization. Learn a process that helped me double my book of business, overs serve my best clients to create near perfect retention and leverage my best clients for introductions into significant prospect opportunities.